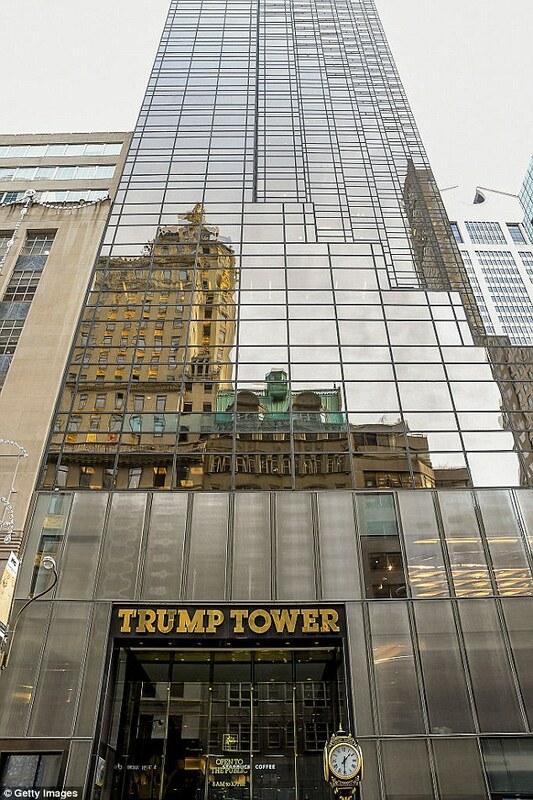 Donald Trump has returned to the iconic Manhattan skyscraper that served as the backdrop for his reality TV shows and the launch of his ground-breaking presidential bid for only his third time since taking office. 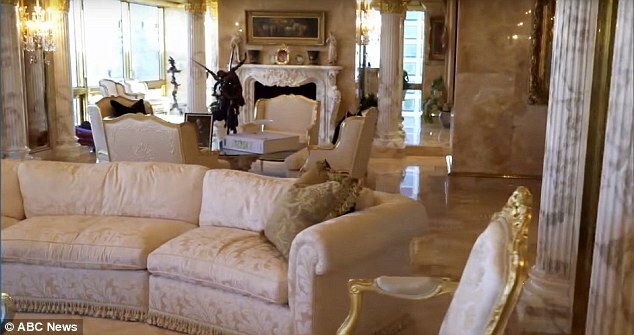 President Trump is staying in his penthouse suite at Trump Tower this week as he and the first lady attend the United Nations General Assembly Tuesday. 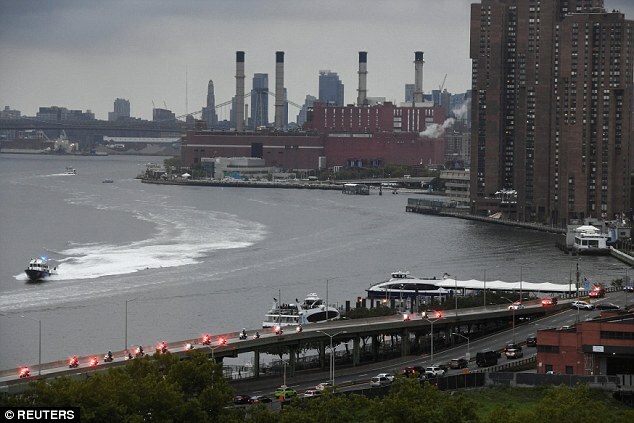 He arrived in lower Manhattan in spectacular style, disembarking Marina One with security ready and a slick black limousine prepared to transport him to his luxury accommodation. The billionaire president spent the night in New York in August of 2017 during a working vacation but hasn't been back in a year. His last stay at Trump Tower was during the 2017 gathering of the UN's 193 member nations. 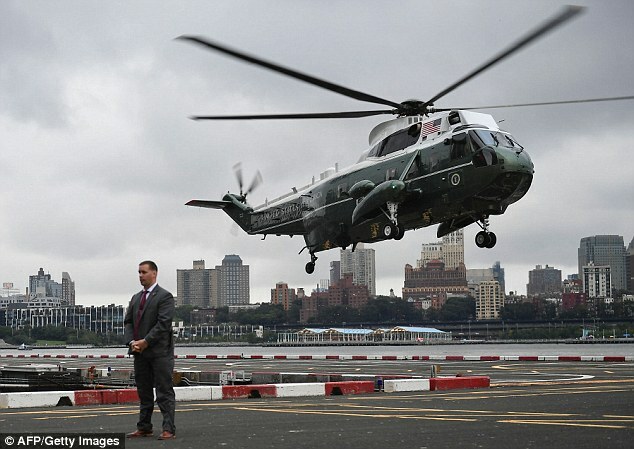 The American leader arrived on Marine One in Lower Manhattan Sunday. 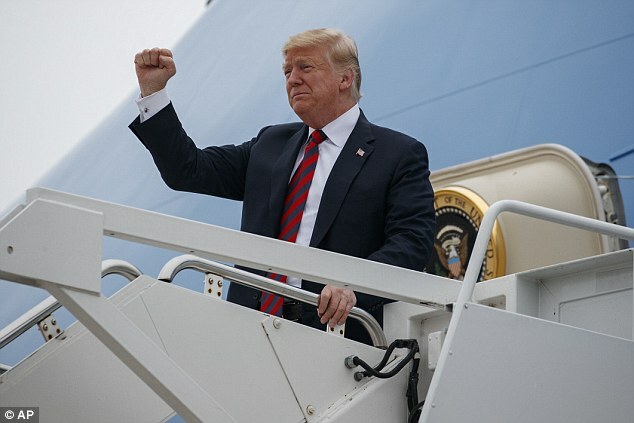 He was seen Friday making a fist pump gesture as he disembarked the aircraft at Springfield-Branson National Airport before attending a campaign rally in Springfield. Trump is making his second appearance at the conference this year, where he will deliver a speech and preside over a Security Council meeting. President Trump will make a 'Global Call to Action on the World Drug Problem' at a counter-narcotics event that he's co-hosting with United Nations Secretary-General Antonio Guterres. 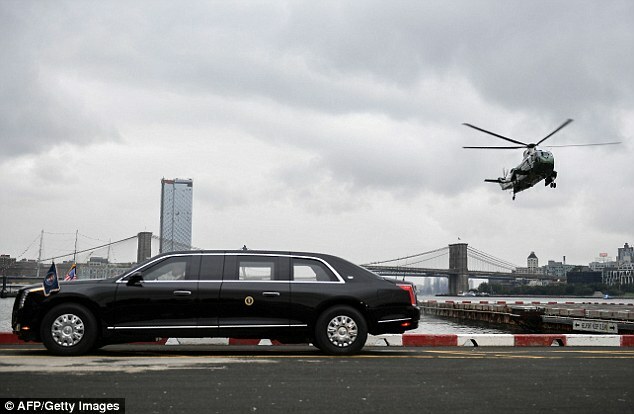 Later he will host a reception for heads of state visiting his home city for UNGA. The U.S. president will deliver remarks at the 73rd Session of the United Nations General Assembly. He will also have a 'pull-aside' with Guterres before attending a luncheon hosted by UN Secretary General. President Trump will have another pull-aide that afternoon with this year's UNGA President Maria Fernanda Espinosa before he attends U.S. Ambassador to the U.N. Nikki Haley's Security Council Presidency Reception. The president will chair a United Nations Security Council briefing, where members will discuss their counter-proliferation efforts. Just like the last time he was in New York, Trump will have little time to reminisce. In the four days that he'll be sleeping at the iconic property, he has a schedule full of meetings that begin as soon as he arrives. Trump will hold a working dinner with the Japanese prime minister this evening in the building that was once his office and residence. The meal is closed to press. Shinzo Abe holds a special place the list of leaders that Trump considers to be not just allies but also friends, having been the first head of government to rush to New York to meet him at Trump Tower after the real estate tycoon's 2016 election. 'Going to New York. Will be with Prime Minister Abe of Japan tonight, talking Military and Trade. We have done much to help Japan, would like to see more of a reciprocal relationship. It will all work out!' Trump tweeted Sunday. Japan is also a key ally for the United States in the Asia Pacific, where the United States is engaged in an escalating trade dispute with China while navigating a tricky disarmament agreement with North Korea. Abe was just reelected himself in the past week - a feat that Trump congratulated him for on Twitter. 'I’m looking forward to many more years of working together. See you in New York next week!' he said. Trump and Abe have much to discuss since their last meeting at the G7 summit in Canada in June. Trump traveled straight to Singapore to meet with North Korean dictator Kim Jong-Un. A year ago at the general assembly gather, Trump derogatorily referred to Kim as 'Rocket Man' in comments that critics of the new president's in-your-face style worried would start a nuclear war. He introduced tough new sanctions on North Korea at the conference, as well, and vowed to keep maximum pressure on Kim's government until it stopped building nukes. In a major turnaround, Kim and Trump signed an informal pact for North Korea to completely and verifiably end its nuclear program in Singapore. So far, the tete-a-tete has not produced significant results on the security end, although North Korea has not conducted missile or nuclear tests since and followed through on a pledge to return the remains of American soldiers' remains. Talks reached a total standstill in late August as North Korea failed to make good on its promises to Trump at the nuclear summit. They were considered back on track by the administration this month after North Korea opted not to use its founder's day parade to show off its arsenal as it had done in year's past. 'The fact that the two leaders in Korea both shook hands and said they want to denuclearize and they want peace, that's no small thing. 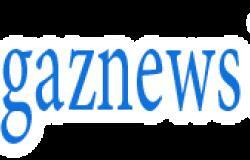 I think the fact that their parade, they didn't show off nuclear weapons for the first time is a major accomplishment,' U.S. Ambassador to the U.N. Nikki Haley told CNN on Sunday.